My frame, fork, and axle sliders kit from OES arrived this past weekend, so Monday evening I decided to get everything installed. I’ve never installed frame sliders or anything like this before, so this was entirely uncharted mechanical territory for me. I did some research into the various frame slider options available for the FZ-07. I almost went with the Woodcraft sliders since they seemed the easiest to install, but they were on backorder, so I decided to go with the full sliders kit from OES. I wish the caps were silver to match the metal frame of the bike, but alas, like most motorcycle equipment, they only come in black (at least I could choose white logos!). I’m thinking if it really bothers me, I can Plastidip them. Right now, I’m just happy to get some additional protection on my bike! Before buying, I read through the instructions online and watched some videos on YouTube on installing frame sliders, and felt like I could probably do this. So, Monday evening I laid everything out on my garage floor, pulled on my gloves and got to work. Step one: Read the instructions. Check. Wait! I need a 10mm and 5mm allen wrench? Um… I checked my toolbox, then my other toolbox, then the drawer of miscellaneous things, and came up with a 5mm allen wrench, but no 10mm. Boo! Boooooo! I hate starting a project only to realize I’m missing one critical component. So, off to Menards I went. 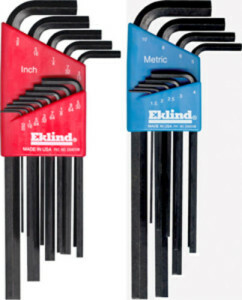 I really just wanted a single 10mm allen wrench, but Menards only had sets for the metric wrenches, and only one set that included a 10mm wrench. So, I had to buy a whole set–which also included an SAE set that I didn’t need. Blah. Well, at least I’ll be prepared for any future IKEA purchases. While waiting to check out, I decided to read through all the instructions again, just to make sure I had everything I needed. Blue AND red thread locker? Whoops! I only have blue. Good thing I double checked! P.S. Does Menards store layout make sense to anyone? Because I can never find a damn thing in there without making at least three laps around the store. In the end I had to ask an employee where the Loctite was because naturally it was nowhere to be found in the “adhesives” aisle. Harumph! Here’s a great idea! 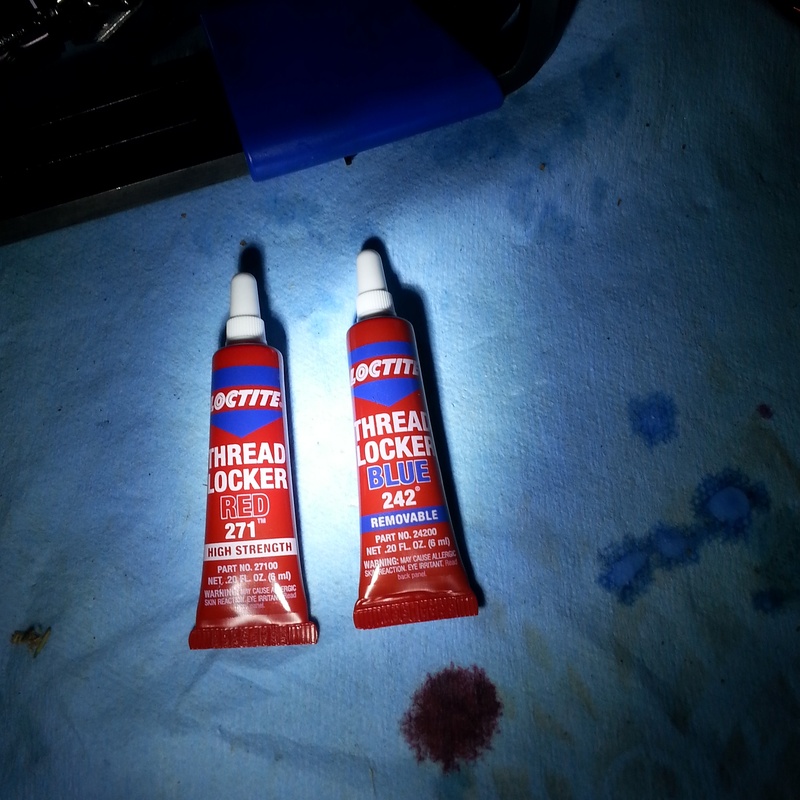 Let’s put both red AND blue thread locker into the same RED tubes! Genius! Finally, I had everything I needed, plus a headlamp because I’m a sucker for impulse buys. (Hey, it was on sale. I saved like 10 cents, you guys! 10 cents! TEN of them.) I ferried everything back home, and resumed my evening project. Okay, step two: Remove the right side engine bolt with a 17mm socket. Right. I have one of those! I popped it on the wrench and… Errrrrgh! Hnnnngh! Gahnnnnng! That bolt did not even budge. Okay. Lightbulb! Let’s try the other side! Maybe it’s looser. Deep breath. Hnnnngerrrgaahaannnn! Nope. I consulted the owner’s manual and saw that the recommended torque for tightening engine bolts was 47 ft-lbs. I had recently purchased a torque wrench to re-tighten the oil drain bolt after changing the oil. I’ve only used it for that, and only once. I am very new to the torque wrench scene. Can I un-tighten bolts with a torque wrench? It has the left/right switch on it, so it seems like yes… maybe? I’ll ask Google. 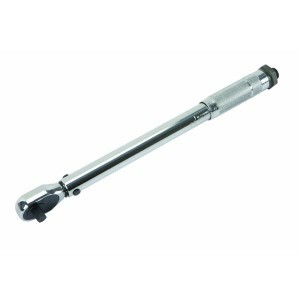 Torque Wrench (Harbor Freight, $22) – Maybe not the world’s most accurate torque wrench, but I’m not building rocket ships here. After wading through some over-my-head discussions about split beam vs click-type wrenches and FULL CAPS WARNINGS about not using a torque wrench as a breaker bar, I finally found a poster on a random forum who said loosening a stuck bolt with a torque wrench is perfectly fine and does not require a breaker bar. Thank you, anonymous source that I whole-heartedly trust to be an expert! I don’t even know what a breaker bar is, but it sounds scary. Okay, moment of truth! I dialed in 50 ft-lbs. on my torque wrench and gave it the ol’ heave-ho. Hnnnggaaa-yes! The bolt is free! And I didn’t break my wrench! Or the bolt! Woo! 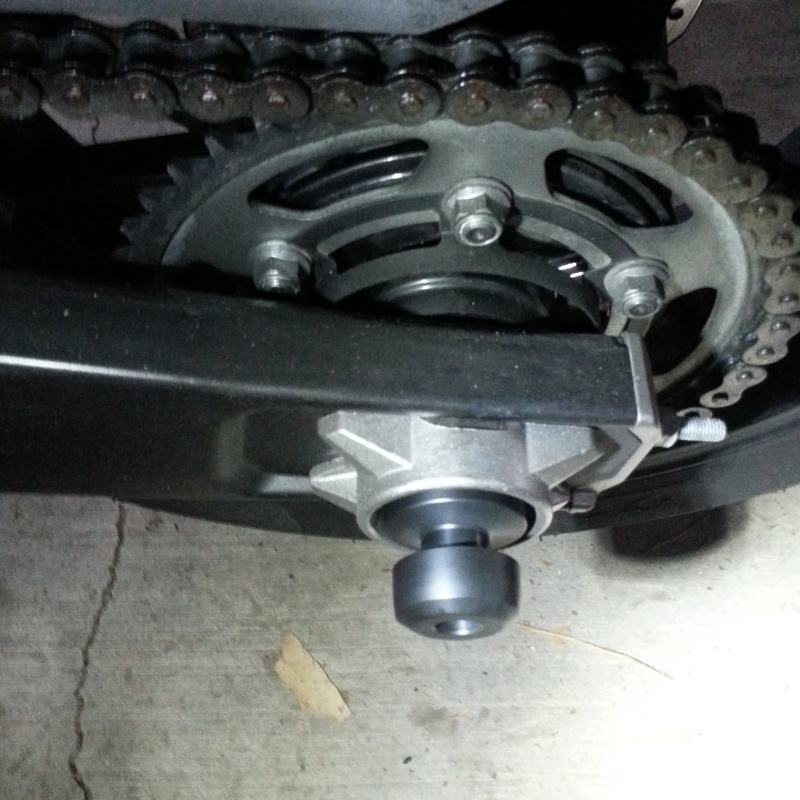 Once that bolt was out, it was a very simple process to install the frame slider. Just dab some oil on the new bolt threads, pop the factory washer on, and screw in the new bolt with a 10mm allen wrench. I realized at this moment that I don’t have any kind of adapter thing to use the torque wrench with a hex bolt. I was too sweaty and grumpy for a second trip to Menards, so I settled for muscle tight. I just repeated the process for the left side and voila! 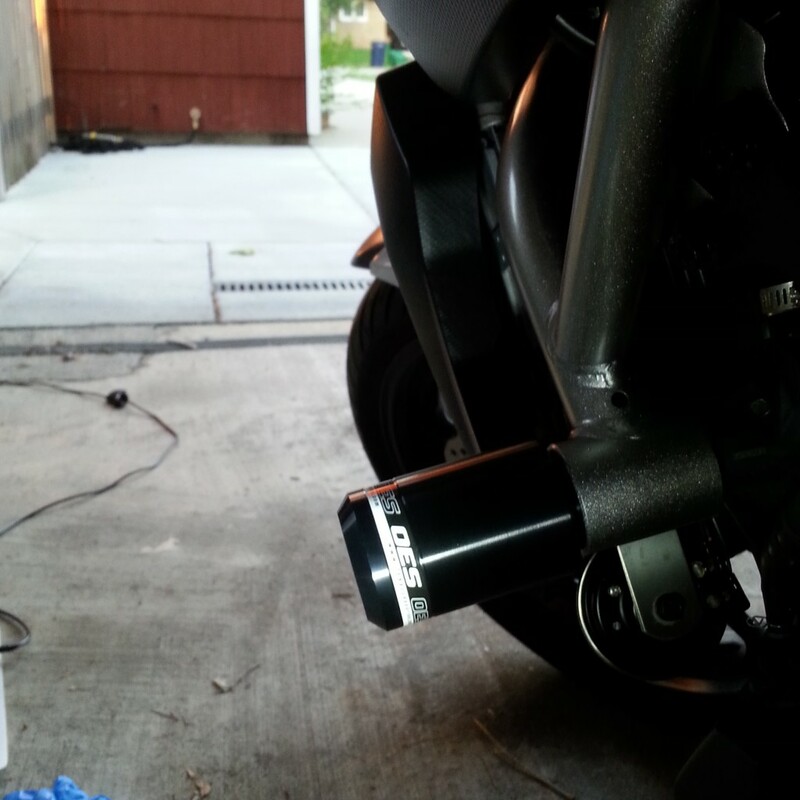 Frame sliders installed! Now it was onto the fork sliders! This is where the blue and red thread locker comes into play, so I made sure to read and re-read and re-re-read the directions so I didn’t mess this part up. Put red thread locker on the right side bolt (the shorter bolt) and screw it into the metal rod (the shorter rod). Okay, how much thread locker do I put on? It doesn’t say… I’ll just do a strip all the way down the screw. In retrospect, that was probably too much. After I screwed it into the rod, I had to wipe away some excess that ooze out of the top of the screw. Well, too late now. Next step, push the rod through the front axle. Then put blue thread locker on the left side bolt (the longer bolt), and insert it into the left side of the axle and screw it into the rod with a 5mm allen wrench. Seemed simple enough. I used the 5mm allen wrench that came with my new set to tighten the left side, and used the random 5mm allen wrench I found in the drawer of miscellaneous things to brace the right side so it wouldn’t spin while I was trying to tighten the left side. The instructions cautioned against tightening these bolts with too much force, so I got them as tight as I could without straining too hard. Hopefully, that’s the right amount of tightness! 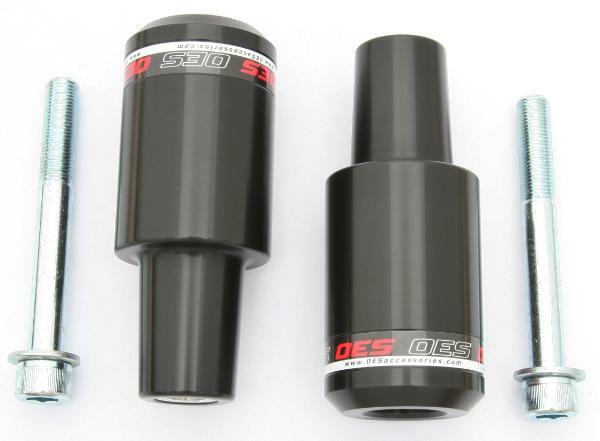 Lastly, the rear axle sliders. It was the exact same process as the fork sliders. Red thread locker on the shorter bolt, screw into the metal rod, insert into right side of rear axle. Then blue thread locker on the other bolt, insert into axle and screw into rod. Hand tightened. Boom. All done! 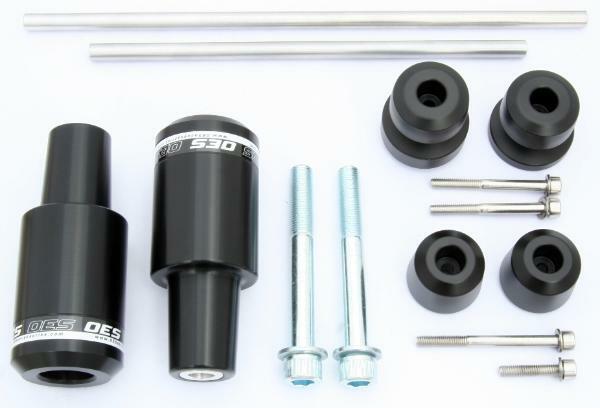 I opted for the spool sliders in case I ever get a rear stand in the future. I actually really like how the front and rear sliders look on the bike. Before, there were just two open areas that looked like they were missing caps or bolts. The sliders give it a more finished look. IMHO, anyway. I’d estimate the actual installation of all 3 slider kits took about 20 minutes. In reality, it took me about an hour and a half if you include the trip to and from Menards, wandering around inside Menards looking for allen wrenches and Loctite, and Googling information about how to loosen engine bolts. I hope I don’t have to test the protective abilities of these sliders anytime soon. However, I do feel a little bit better about leaning over more in corners now. 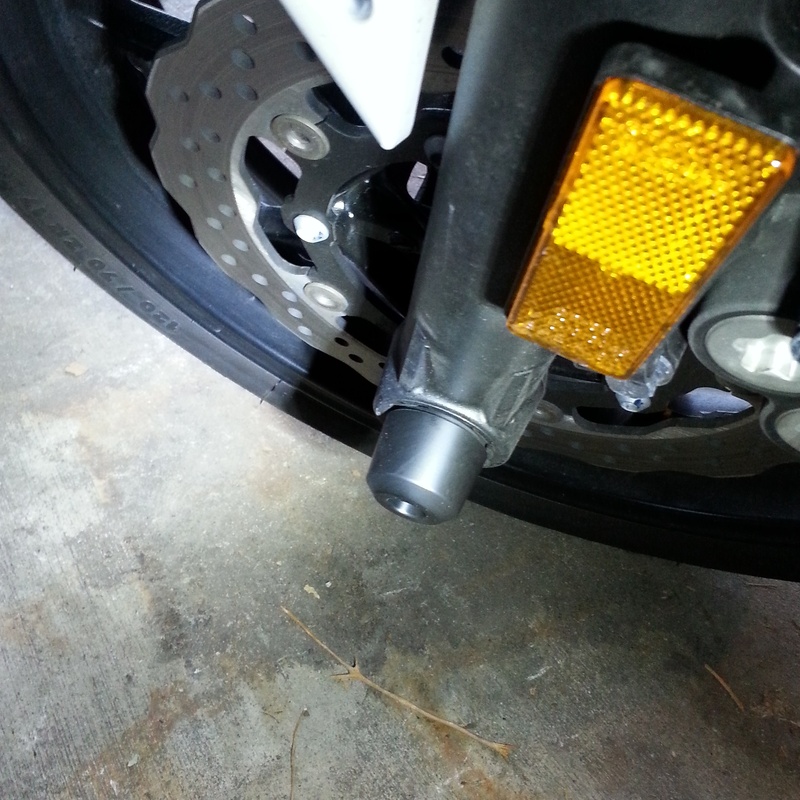 The frame sliders don’t stick out nearly as far as saddlebags would, but at least they will keep some of the weight off of my leg in the event of a fall or slide.